Looking for Strawberries Facts in 2019? Scroll down this page and follow the links. And if you bring home some fruit or vegetables and want to can, freeze, make jam, salsa or pickles, see this page for simple, reliable, illustrated canning, freezing or preserving directions. There are plenty of other related resources, click on the resources dropdown above. See this page for easy strawberry jam and preserves recipes and complete directions. And this page shows you how to freeze strawberries to use later! Berries on a straw? There is a legend that strawberries were named in the nineteenth-century by English children who picked the fruit, strung them on grass straws and sold them as "Straws of berries". Another theory is the name was derived from the nineteenth-century practice (ands still today, although most farms use raised beds, enclosed in plastic) of placing straw around the growing berry plants to protect the ripening fruit. But the most widely held view is that the name Strawberry was derived from the berries that are "strewn" about on the plants, and the name "strewn berry" eventually morphed into "Strawberry". Fragrant - The strawberry belongs to the genus Fragraria in the rose family, along with apples and plums. The name of the scientific classification was derived from the Old Latin word for fragrant. The modern Italian word for strawberry is still "Fragola". Very berry or not? The strawberry is not classified by botanists as a true berry. True berries, such as blueberries and cranberries have seeds inside. The strawberry, however has its dry, yellow "seeds" on the outside (each of which is actually considered a separate fruit). Ornamental value - The English and French also found strawberries used the beautiful heart-shaped berries to landscape their gardens. In fourteenth-century France, Charles V ordered twelve hundred strawberry plants to be grown in the Royal Gardens of the Louvre. Seedy characters - On the average, there are 200 tiny seeds in every strawberry. If all the strawberries produced in California this year were laid berry to berry, they'd wrap around the world 15 times. 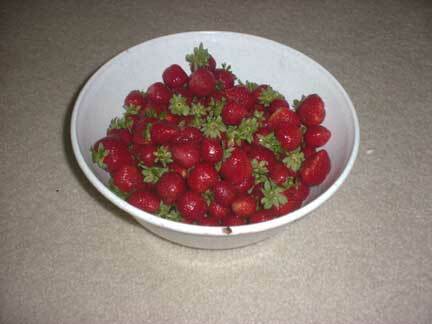 That's enough strawberries to provide every U.S. household with 12 pint baskets. Are you weird? Respondents to a recent national survey labeled strawberry lovers as "health conscious, fun loving, intelligent and happy." Non-strawberry lovers, on the other hand, were described as "weird, boring, stuffy--picky, fussy eaters who avoid healthy foods." Eight medium-sized strawberries contain 140% of the U.S. RDA for Vitamin C. One cup of fresh strawberries provides about 88 milligrams of ascorbic acid, which more than meets the Recommended Daily Dietary allowance of 45 milligrams for the average adult. Vitamin C is well retained when the strawberries are handled carefully. Capping, injuring, cutting, or juicing, however, will reduce the vitamin content. In addition, strawberries are good sources of folic acid, potassium and fiber. Strawberries are also fat-free and low in calories. If you're expecting a baby, you'll be very interested in some of the new discoveries about folic acid. In fact, 8 strawberries have 20% of the folic acid you need every day. Fresh juice from sieved strawberry pulp has a cooling effect on feverish patients. For a cooling and purifying drink, either pour water on crushed berries or chop the berries roughly and whirl in a blender with a little water. As part of the 5-a-day program suggested by the American Cancer Institute, strawberries can also play a part in helping you to reduce the risk of cancer or heart disease. Also see this excellent PDF file from the University of California : "Strawberries: safe methods to preserve, save and enjoy"
Here's a tasty desert that can also be very healthy! 1 (12-ounce) container of whipped cream, topping, Cool-Whip, etc. If you use a fat free version of these, it can be healthier! 1 cup cottage cheese (large or small curd); again regular, low fat or fat free.